It can take 10, or 20, or even more times for young kids to be exposed to a food before they want to eat it. And even after they discover they like a food, they may eat it one day, and not the next. Now you know why half of your toddler’s plate often ends up in the trash! You can totally serve the food the same way each time, but I find myself getting bored when I do that. And your kids might be tired of seeing the same exact thing on their plate every time, especially if it’s a food they aren’t all that excited about to begin with. Recently, I decided to pick one vegetable to serve a bunch of different ways to my son. I wanted to see if changing the way I presented it would have any effect on him choosing to eat it. And you know what? It TOTALLY worked! 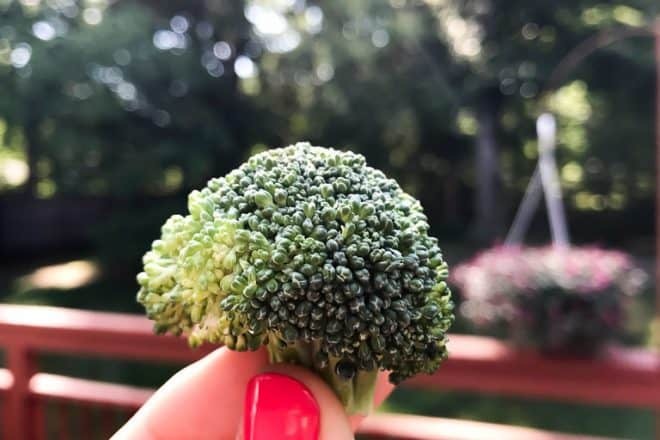 The first time my son willingly ate broccoli once he became a toddler (as a baby he ate EVERYTHING and then stopped) was when I pretended it was a mini tree and made up a little story about it. He said, “I want a tree! I want a tree!” and munched the top right off. That got me thinking about other fun ways I could serve broccoli. Oh, the exciting life I lead. You don’t have to drive yourself nuts always finding fun, new ways to serve foods. But, if it’s not going to take me a ton of extra time, I like to present food in a way that will be appealing. I figure it works on adults – a beautifully plated dish at a nice restaurant makes you more excited to eat it – so why not do the same for kids? Check out my favorite new ways to get your kids to eat broccoli, and try them out yourself! This is how my grandma served us broccoli as kids. She steamed the florets, then mashed them up with a little butter, salt, and pepper. Simple and delicious. You could probably make quick work of this in the food processor. Or, try out the bagged broccoli “rice” at Trader Joe’s. Everyone loves chips! Roast in the oven at 375 or 400 degrees. Find detailed instructions for the recipe at the Tasting Page. My son went nuts over this snack of pretzel sticks dipped in hummus, topped with these green “sprinkles.” I just chopped the very tops off of a few raw florets of broccoli. Since this is more of a garnish, you can try it on almost anything! Top baked or mashed potatoes, soup, you could even put them inside a quesadilla or grilled cheese sandwich. You may have tried zucchini noodles, (which is actually what is pictured here) but what about broccoli noodles? Head to Inspiralized for a video how-to and lots of recipes for broccoli noodles. My son thought this cat toast was hilarious. I had a bag of broccoli slaw on hand (from the grocery store, it’s just a mix of shredded broccoli and carrots) and it looked like the perfect whiskers to use on top of peanut butter toast. These little bites of broccoli and potato from Dr. Praeger’s are perfect for a last-minute veggie side. I know raw broccoli florets are nothing new, but try introducing them in a different way. Present them as “trees,” or serve them with a new dipping sauce, like honey mustard! I haven’t tried these yet, but just added them to my Amazon cart. I think they will be fun not only for broccoli stalks, but for other fruits and veggies too! Kids love things made just for them! Spell out their name or even just the first letter like I did with pieces of broccoli stalk. I’d save this one for when you are on the go and need a packaged snack. Your kids will be surprised that they are eating broccoli with Brad’s Raw Organic Gluten-Free Broccoli Poppers ! How do you get your kids to eat broccoli? Really great ideas, some that are totally new to me/haven’t seen elsewhere. Keep up the great work! Thanks, Shelley! I really appreciate the kind words!